… You’re a Mom who wants to reenter the job market, but can’t return to your earlier field with its extensive travel, so now what? … You’re working too hard every day for too little, and even suspect you may be restructured out of this thankless job, but what to do? … You want to move your kids closer to your parents, but have been trying for two years without any success and feel helpless. … You’ve read every self-help book and talked to your gal pals for far too long, and are still bogged down. After all these fruitless attempts to get unstuck, at this point are you mentally screaming, I’VE HAD ENOUGH! All the outside advice in the world will not get you unstuck, but there is a way into a fresh, exciting new life. The secret to a riveting “Second Act” lies within you. 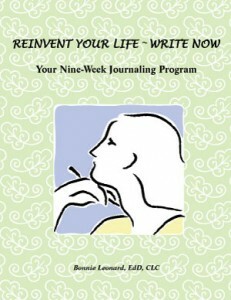 The unique, nine-week eCourse, Reinvent Your Life ~ Write Now enables you to listen for, tune into, and be guided by that small, still voice inside you that knows the authentic way forward. After reading all those self-help books, why not launch your own reinvention journey by uncovering your own guidance? With its well-tested writing exercises and prompts, this eCourse dips you below the surface of your conscious mind to unearth the treasure lying at a deeper level. Week by week, you’ll discover what you need, who you are and what you want – the essentials for traveling a reliable path to a more fulfilling life. You can take the first step by signing up for this reinvention eCourse to uncover the wisdom of the small, still voice inside waiting to be heard. Why not start on this reinvention path today for a temporarily discounted purchase price of $35.00. ARRIVES in your inbox IMMEDIATELY and then each week thereafter with about 15 pages of material to download, print out and journal in – at home, or at your favorite coffee shop. includes WELL-TESTED WRITING EXERCISES AND PROMPTS that allow you to dip below your conscious mind and locate the true wisdom that resides there. supplies motivating STORIES OF OTHER MIDLIFE WOMEN to inspire you and serve as examples for your writing exercises and prompts. serves up a COACHING REQUEST each week that enables you to ground your learning from that week’s journaling. provides a STRUCTURED PROGRAM where you learn: what you actually need, who you truly are now, and what you really want, to create an exciting, ready-to-jump-out-of-bed-each morning life for yourself. Bonnie helped me find the courage and confidence to seek a new career path. Thanks to her, I landed my dream job. But her guidance goes beyond just that. Bonnie taught me to seek a more balanced life for myself. She encouraged me to seek not just my dream job, but also to pursue my hobbies and consider how to make my days more fulfilling. Thanks to Bonnie, my life is now more complete!